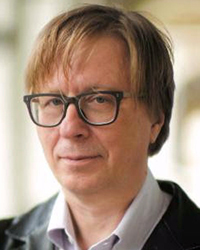 It was announced yesterday that Georg Friedrich Haas will be composer-in-residence at this year’s HCMF, and that among the works receiving their first UK performances will be the Octet for eight trombones. 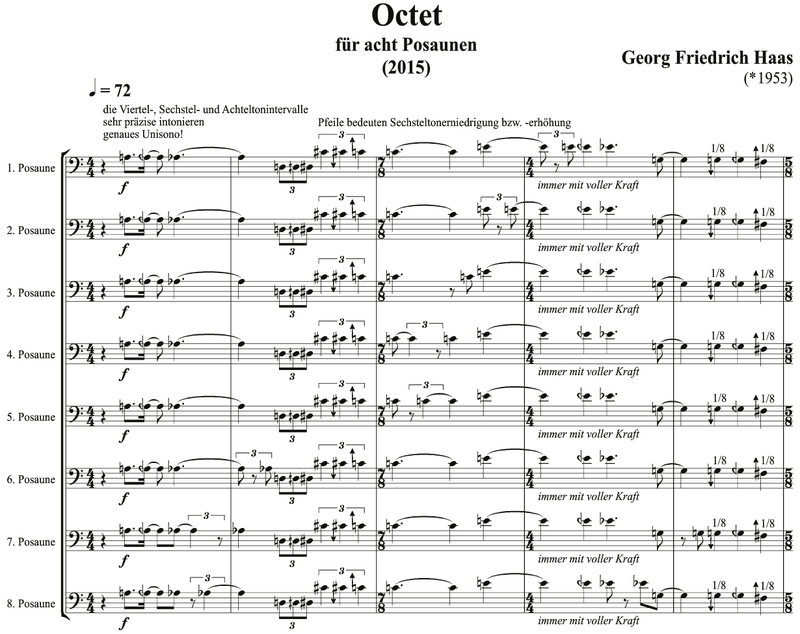 Composed last year, it’s a remarkable piece, commissioned by Hannover Trombone Unit, a group of graduates from Hannover University of Music, Drama and Media, who are clearly up for more than the usual kind of challenge. When composers assemble unusual line-ups of instruments like this, they invariably have a very specific idea in mind that they’re looking to exploit. Uppermost in Haas’ mind, it seems, were the microtonal possibilities not so much with respect to individual instruments but in relation to and conjunction with each other. His use of them, including quarter-, sixth- and eighth-tones, is hugely striking but also borderline sadistic. The excruciating difficulties facing the players begin in the very first bar (see left, click to enlarge), where Haas embarks on the lengthy unison melodic line, filled with all of these types of microtones, the score gleefully emphasising the need for “sehr präzise intonieren, genaues Unisono!” (very precise intonation, accurate unison!). This is gradually broken up with fragmentations into a dense cluster, before separating into a layer of low grumbles above which apparent scales of harmonics play out. 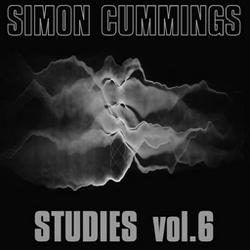 But Haas is determined that his music be built upon foundations ever in flux, and these scales find themselves slowly slithering downwards, before the gears clunk into reverse and all eight players now start ascending upwards in a sequence akin to the sound of Shepard tones, blighted by an occasional, very subtle, kink or glitch. That opening level of demand now returns with microtonally-moving perfect fifths, like a leftfield cross between organum and a fanfare. The notion of harmonics again moves into the foreground as notes are held, forming a complex ‘overtone’ chord, the individual partials of which swell and ebb, interspersed with angry bouts of loud buzzing. The chord ostensibly settles but notes begin to tilt out of alignment until the entire chord starts to rise. Now Haas opts for microtonal parallel triads(! ), undermined by a counterpoint of low parps, seemingly ridiculing the attempt at such ludicrously laboured accuracy. The ensemble thereupon finds itself in a chorus of downward glissandi, arriving in a sequence exploring near-unisons, which in turn leads back to a final tutti melody in a higher register, heralding the coda. Haas extrudes pitches from this line, forming a rich, beautiful resonance that balances itself (barely) around a 7th chord, full of tiny dissonances that cause it to shimmer. 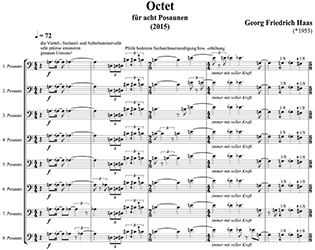 Structurally and materially, the Octet is a straightforward piece, but of course the performance difficulties posed throughout are so absurdly taxing it would put off any but the most tenacious ensemble. This performance of the German première, given by Hannover Trombone Unit at last year’s Donaueschinger Musiktage (they had given the world première just a week earlier in Basel), is nothing less than heroic, the unisons, fifths and triads in particular sounding with a level of accuracy that’s genuinely uncanny. HCMF 2016 is in for a real treat. 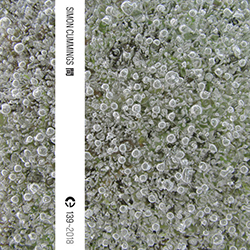 My involvement with audio tapes played by Giacinto Scelsi entailed a surprising realisation: that melodies – singable melodies in the traditional sense – are also possible in the smallest micro-intervallic steps. The comparatively rough transcriptions of Scelsi’s works, most of which are notated no more precisely than in quarter-tones, made this quality of the music unrecognisable. (Unfortunately, the tapes are all but inaccessible to the public). As with my Ninth String Quartet and my piece for solo trumpet I Can’t Breathe, I am also attempting to compose micro-melodies in my Octet for eight trombones, almost didactically approaching quarter-tones and sixth-tones up to eighth-tone steps, which must be intonated meticulously. The piece is composed for a space with a long reverberation time. The musicians must stand closely together so they can hear themselves precisely. The work is not conceived as a polyphonic tissue; rather, it is a largely homophonic mass of sound, only occasionally splitting up. The Octet for Eight Trombones is dedicated to my partner Mollena Williams. Her energy, her vitality, the richness of her personality, have influenced the music (so I hope), along with the spirituality of our relationship. Thanks, Simon! On the strength of this upload, this year’s HCMF is a mouthwatering prospect indeed! Funnily enough, I dipped my toe in the waters of last year’s composer-in-residence for the first time only yesterday, via another piece for wind ensemble, Mémoire, horizon. And are you familiar with Kalevi Aho’s 9th Symphony, during the final movement of which the trombone soloist is asked to play chords? Regardless of whether his choice of idiom(s) is one’s cup of char, Aho is undeniably a wizard when it comes to instrumentation.